RGNA members and their neighbors are invited to "light up the night" with luminaria along the City sidewalks for a glowing holiday display of the neighborhood for all to enjoy. Walk along and meet your neighbors, perhaps stopping by a friendly porch to sip a hot toddy or mulled cider along the way while taking in the crisp night air. Hope you’ll join in lighting up our West End for a memorable evening display! 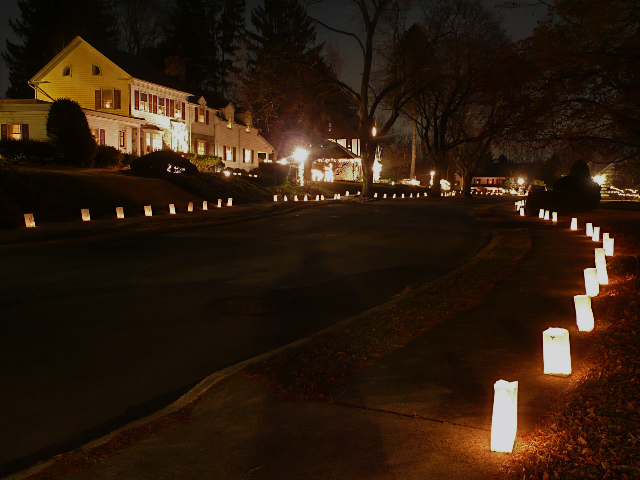 Please light your luminaria by 5:00 PM and enjoy visiting with neighbors while delighting in the beautiful glow of the lights. (1) White lunch bags - 6"x 4"x 12 ¼ " size works best. If you can't find these, use the next smaller size. (5) Allow time (1/2 hr. - 1 hr.) to set-up your luminaria so they can be burning by 5 p.m.!